HPI E10 Drift Monster/Falken Tire 1/10 Scale RTR Review « Big Squid RC – RC Car and Truck News, Reviews, Videos, and More! Forget The Fast and the Furious Tokyo Drift and all the other crap you’ve seen in the movies… Formula Drift is the real deal when it comes to drifting. Since most of us don’t have the skills, sponsors, or wallet to compete in the Formula Drift series, we’re left to our own devices when we feel the need for speed. And, since drifting will most likely get you arrested, a full size car won’t do. Luckily, HPI has an RC outlet in the form of their E10 Drift vehicles. 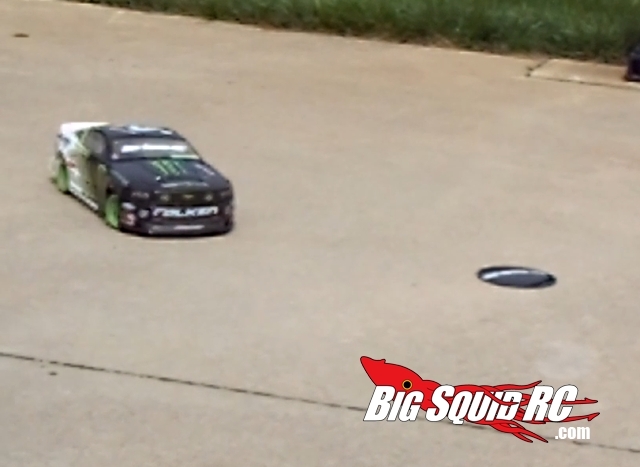 Does the Monster/Falken Tire Ford Mustang satisfy my craving to get a little sideways? Hit the jump to find out! Advertised as a Ready-to-Run, the E10 Drift delivers. It comes with everything you need to get your drift on, including the batteries for your transmitter! All I had to do was slide on the antenna tube, charge the battery, put AAs in the radio, and I was ready to rock. If you’d like to see exactly what this thing looks like as you open it, check out our unboxing! Wow, does this thing look awesome! Anyone at BASH-A-PALOOZA 2011 got to see the inspiration for this vehicle up close and personal as Vaughn Gitten Jr. gave drift demos all day during the show. From a distance, this little guy looks just like the real thing. They even attached little plastic brake rotors and calipers to the wheel hubs. A very cool touch to make this thing appear as realistic as possible. The tires look great, but are made of VERY hard plastic. Clearly, this car isn’t set up for traction. Out of the box, the motor nearly fell out of the vehicle because the mounting screws were so loose. If I had put a battery in and hammer the throttle, the spur gear would have been gone in a second, killing all the fun before I even got started. If you remember, our *UPDATED* Firestorm Flux came from the factory with the radio and receiver not bound. Missing the radio binding on the Firestorm and the motor mount screws on the E10 has me wondering about some of the quality control measures being done, or not being done over there at HPI. The radio that comes with the E10 Drift is the TF40, a welcome change from the TF20 that came with the Firestorm Flux. 2.4GHz, dropped wheel, and a 3rd channel to control an additional accessory is all greatly appreciated. The radio feels pretty good in the hand, and as far as stock radios go, is quite acceptable. Lastly, the ESC comes setup pre-configured for lipo batteries, yet the vehicle doesn’t ship with one. This could be confusing for some newer drivers of RC, but worked out okay for me as I didn’t have to look in the manual to configure the ESC. Speaking of batteries, the battery tray has a pretty funky ribbed design, making it hard for some batteries to fit into the vehicle. Common for on-road vehicles I’m assuming, but a bit troubling for bigger lipos, especially hard cases. 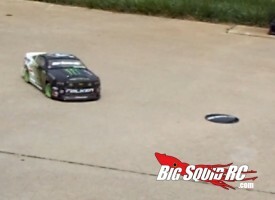 Oh…I could see this drifting thing becoming really addictive. I wrestled a 2S lipo into the car and gave it a short test beat around my basement. The tires spun a TON as I mashed the throttle, but had just enough traction to get the car moving forward smoothly. As I turned the wheel, the car slide sideways and held a 45 degree angle right underneath my pool table. I straightened out the tires and the car smoothly righted itself and started forward again. Call it beginners luck, as I haven’t done anything quite that cool since, but let me tell you, it was awesome! Time to hit the pavement! The E10 Drift and I hit up a variety of locations around town. I drifted on concrete sidewalks, tons of asphalt, and even in a carpeted gymnasium. Not to state the obvious, but a larger, smooth area is preferable to get your drift on. I was able to drive, drift, and have some fun on some pretty rough, cracked, and ugly asphalt, but the experience was far from optimal. That has nothing to do with the vehicle, but it is worth pointing out that you’ll want to have some areas you can drive this in that are smooth, like newly paved parking lots for example. As always, GET PERMISSION BEFORE YOU DRIVE! The E10 was drift-able (is that a word?) on carpet, but the preferred surface is definitely smooth asphalt or concrete. Driving the drifter takes some…getting used to. As I stated above, there is a ton of wheel spin. Throttle heavy guys will do lots more donuts than drifts. The hard plastic tires also don’t allow the vehicle to stop, and locking up the tires under braking causes the car to slide forward quite a bit before it slows to a stop. Keep this in mind as you barrel towards a curb. I also found that running full speed and then cranking the wheel just bulldozes the car forward, shoving the turned wheels over the ground without turning at all. A couple blips of the throttle however, and you’re sliding again. It really takes a pretty disciplined combination of throttle and steering control to keep this car drifting under control. Under control is the key part in that sentence. I found that getting the car sliding was fairly easy, but keeping it under control was a challenge. That challenge is what made this car so much fun to drive. It was never frustrating, and when you pulled of a sick drift or controlled donut, you just felt this sense of coolness and accomplishment. It rocked. The E10 Drift isn’t fast. It isn’t supposed to be. The brushed motor does a great job delivering enough power to keep the wheel spinning and the car drifting, but you’re not winning ANY speed contests, especially with the lack of traction. That isn’t the point of a drift car though. It’s about style, the E10 Drift has plenty of it, even behind my novice skills. As for durability, I haven’t seen any issues. This car isn’t going to be on a track, hitting jumps or driving off drivers stands. It is going to smack curbs, pot holes, feet, car tires, pylons, and anything else you can find in a parking lot, especially as you learn what it takes to drift under control. I hit a sign post at full throttle twice, but the foam bumper up front soaked up the impacts. There have also been…I don’t know…a hundred curb, foot, and tire smacks with no broken parts. The tires do show signs of wear, but that’s expected as they rub against hard asphalt over and over and over. They don’t wear at an alarming rate, but they won’t last forever either. The runtime on a 2S 5000MAh lipo was awesome. 20-30 minutes easy. Drifting isn’t for everyone. I happen to know a certain BSRC writer who’s name rhymes with “hubby” who isn’t a fan. However, I can officially say I am a fan…a big fan! 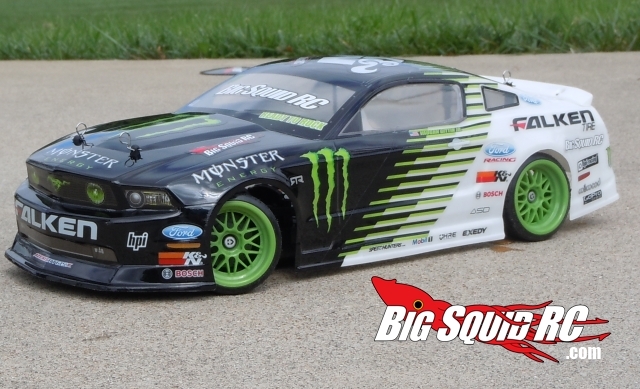 There is just something so very cool about driving an RC drifter like the E10 Drift. It really gives you that sense of realism, especially when you start adding all the accents like under glow kits, side view mirrors, killer paint jobs, etc. This thing drew in TONS of attention from just about anyone who saw me driving. Most everyone was blown away by how real it looked driving and sliding around. If you’ve ever had any interest in drifting, pick one of these cars up. You won’t be disappointed. As always, if you see us at a bash or a show, stop over and say hey! 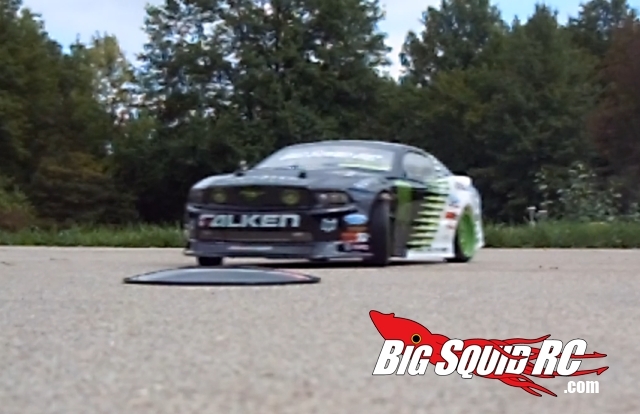 Grab some stickers, talk some RC, and maybe take a turn behind our E10 Drift! As always, if you have any questions or comments feel free to post them here, or e-mail me at evan(at)bigsquidrc(dot)com! Time To Bash – 7.0/10 – Everything is included which is just awesome, however, you are stuck with a wall charger. Be prepared to wait awhile on that guy. Workability – 7.0/10 – The car is easy enough to work on, but I knock everything down that uses Phillips headed screws! Unacceptable. Also, a Deans connector on the ESC and battery would be nice instead of a Tamiaya style. 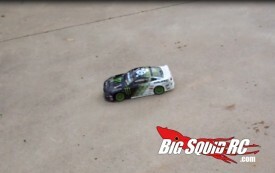 Car Show Rating – 10/10 – In a couple of the pics I had taken, I forgot I was looking at an RC car! This thing looks absolutely awesome. Bash-A-Bility – 9.0/10 – I’ve smacked lots of curbs, tires, feet, pot holes, rocks, etc. Nothing has come loose or broken. I’ve even drove it off a set of stairs with no damage! Fun Factor – 9.0/10 – Like I said earlier, driving this car just gives you this awesome feeling, and learning/polishing your drift technique is a blast. Handling – NA/10 – I’m going to opt out of this category. I can say that it drives/drifts great, but I don’t really have anything to compare it to, so I can’t really rate it. Power – 7.0/10 – You’re not winning a race against anything with this. However, speed isn’t the name of the game here, and the E10 has plenty of power to keep sliding sideways. Value – 9.5/10 – Completely ready to run, easy to drive, but a challenge to master, super awesome looks…for $200?! That’s what I call a great value. Big Squid Rating – 9.0/10 – Tentacles! The car looks incredible, drifts great, and has a huge coolness factor! Completely ready-to-run, 2.4GHz, and durable. It’s almost perfect for anyone interested in drifting, gymkhana, or just going out and having fun on the blacktop. I’d like to see some hex screws, and maybe a faster wall charger, but those are tiny flaws in an otherwise awesome vehicle. Bash heavy!